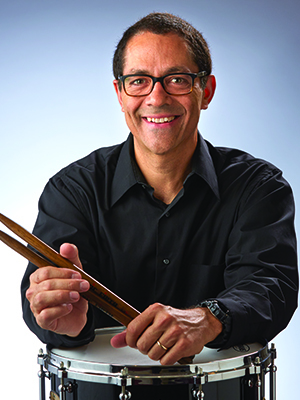 Braham Dembar joined the Indianapolis Symphony Orchestra as Principal Percussionist in 2007. Before coming to the ISO, Braham was Principal Percussionist in the Fort Wayne Philharmonic. He is currently an Assistant Professor of Percussion at Ball State University and prior to that was Instructor of Percussion at Marian University in Indianapolis. Before coming to Indianapolis he was a Continuing Lecturer in Percussion at Indiana University/Purdue University in Fort Wayne where he was head of the percussion program and directed the university percussion ensemble. Before coming to Indiana, Braham performed regularly as an extra with the Boston Symphony Orchestra and Boston Pops Orchestra, was timpanist of the Handel and Haydn Society, and performed with many other orchestras in the Boston area. Braham earned a B.M. in performance at Boston University, and an M.M. in performance from New England Conservatory. He spent two summers as a fellow at the Tanglewood Music Center, attended the American Institute of Musical Studies in Graz, Austria, and participated in the Spoleto Festival in Spoleto, Italy. He also attended Juilliard Pre-College during his high school years. His major teachers have included Vic Firth, Charles Smith, and Thomas Gauger all of the Boston Symphony Orchestra, and Alan Abel of the Philadelphia Orchestra. As an active performer and clinician, Braham has given clinics for PASIC, Indiana PAS-Day of Percussion, Music for All, LSU, Indiana University Jacobs School of Music, and at Indiana University/Purdue University in Fort Wayne. He has also recorded with the Indianapolis Symphony Orchestra, Cincinnati Symphony Orchestra, Burning River Brass, Fort Wayne Philharmonic, and Hal Leonard Publishing and performed with the Chicago Symphony Orchestra. Braham currently endorses Vic Firth, Zildjian, Pearl/Adams, and Evans percussion products. He lives in Indianapolis with his wife and two children.